Please do not hesitate to contact Alan or Wayne on 03 9791 8455 for more information on what an exhaust can do for your vehicle. 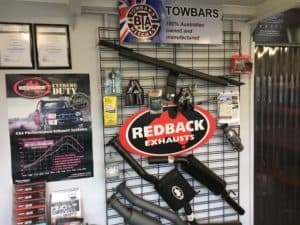 Due to the poor quality of imported systems and the associated fitting problems, we solely sell Australian Made exhausts. Even with Australian made you have to choose your manufacturer carefully. We recommend Redback Extreme Duty & Lukey 4x4 exhausts, as we believe they are two of the best products on the market. We only sell mandrel bent systems as this gives optimum performance gains. In many cases we offer both 2.5” & 3” systems. The bigger the size isn’t normally the optimum size for each vehicle. Where a catalytic converter is required, we use 200 cell high flow diesel cats in our systems. The standard cat is 400 cell & quite restrictive. We also offer no cat systems on some models. On our systems we use free flowing straight through designed mufflers. This gives the best performance, but due to the design & internal packing we prevent drone. We also offer pipe only systems on some models. Unlike most of our competitors, our warranty is Australia Wide. In the unlikely event you experience a problem, all it takes is one call & we will rectify your warranty issue. Redback Extreme carry a 3 year warranty, whereas Lukey 4x4 is 2 years. We are an established family owned business with over 100 years combined experience. We can solve any towbar or exhaust system issue. We pride ourselves on offering the right advice to our valued customers. We offer options where applicable, and take the time to ensure your requirements are met. We have excellent relationships with our suppliers & manufacturers. This not only makes our life easier, but gives our customers the best support in the industry. We understand that the key to our continued success is giving our customers exceptional service, both during & after the sale. We are proud of our reputation & thrive on customer referrals.